Thermostats are used to turn on heating or cooling systems to bring the home to a set temperature. In addition to basic temperature control, programmable thermostats can be used to manage the indoor environment of your home at different times of the day or week. This type of control can have a dramatic impact on the overall energy use of your home. 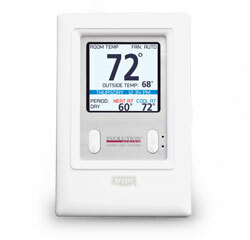 We carry a complete line of digital thermostats, including Honeywell thermostats and Bryant models including the Bryant Evolution Thermostat, Preferred Series, and Legacy Line. Let us help you choose the best programmable thermostat to match your lifestyle. Accuracy: Some thermostats have a tighter +/- range than others. Ease of use: Programming and readability of the thermostat display both factor into this. Number of programmable periods per day - how many times per day will you need the temperature to change? Here at Metzger's, we carry a full line of Honeywell programmable thermostats and will be happy to help you select the right model. The Bryant Evolution Control is the industry's most complete comfort system interface. It offers an unparalleled range of comfort control from one convenient and easy-to-use wall-mounted source. Installed by your trusted local Bryant dealer and backed by the best name in the business, this product helps deliver the comprehensive whole-home control you and your family deserve. On its own, the Evolution™ Control is a remarkable upgrade from the ordinary thermostat. In concert with Bryant variable- speed equipment and any Bryant central air conditioner or heat pump, this special inter- face becomes the focal point of a Bryant Evolution® System. The Evolution Control not only controls your comfort, it controls your efficiency, too. Full, seven-day-a-week programmability lets you set temperature and humidity levels for the best combination of comfort when you're home, and extra-high efficiency when you're away. For additional efficiency, TrueSense™ dirty filter detection lets you know right away when it's time to change your media filter, and the accessory status indicator lets you track maintenance needs of other accessories such as a humidifier, UV lights or a ventilator.